LEXINGTON – Seaton Center, “Court 2” presented by SAVAGE Apparel, Nationals 2017: GVSU def CMU 2-1 in the 2017 Championship Match. 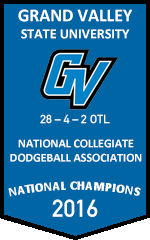 Grand Valley State University Club Dodgeball is the National Champion for the 2017 college dodgeball season. At the conclusion of the 57 match event, the Director of Nationals, Colin Hiatt [UK, #44-C], along with the rest of the National Collegiate Dodgeball Association Executive Board, presented the Championship trophy to Brandon Meisel, GV Captain on Sunday afternoon. The 2017 Season included 286 ranked matches and 304 events, with 32 participating Member Teams. The NCDA has 836 registered members across 27 States as of 2017-04-11. This is GVSU’s fifth consecutive National title, in addition to being their ninth National title overall. 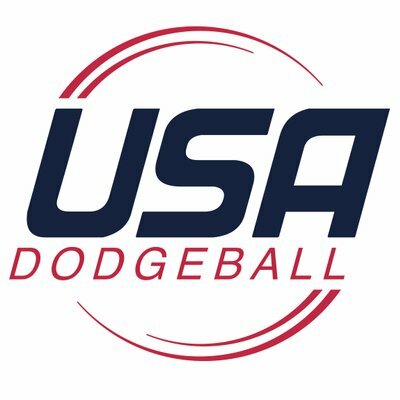 This was the 13th National Championship for Collegiate Dodgeball competition; the NCDA was founded April 9th, 2005. GVSU was the top rated team (56.623) going into Nationals, and was seeded #1 in the Tournament Bracket with a 57.213. They finish the 2017 Season with 29 wins and 3 losses, including going 4-2 in overtime. Defeating #2 ranked CMU in the 2017 Championship, they also finish the season with the current highest Gonzalez rating of all time, 59.240. The past record (58.206) was set by GV at the end of the 2016 Season. BOWLING GREEN – BGSU Perry Fieldhouse, Court B “Savage Apparel”: GVSU def CMU 1-0 in the 2016 Championship Match in College Dodgeball. This is their eighth National title, capping a series of four successive titles from 2013 to 2016. This matches the earlier quaterpeat from 2007 to 2010. 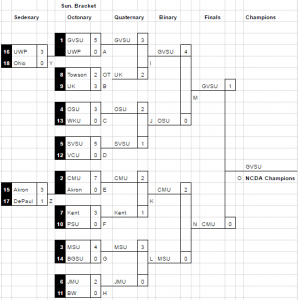 GVSU was first in the Standings going into the Nationals event, and was seeded #1 in the Tournament Bracket. They finish the 2016 Season with 28 wins and 4 losses, 2 of which happened in Overtime. They also finish the season with the current highest Gonzalez rating of all time, 62.662. 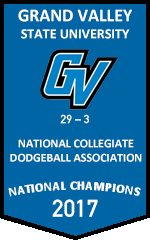 Grand Valley State University is the 2016 National Champion in college dodgeball. Somebody update the wiki! With an army of supporters and a 9-0 record the GVSU lakers clearly came into their final matchup with the OSU Buckeyes (7-2) on a mission. A 3-1 decision and one silver trophy later, it’s safe to them to unfurl the “MISSION: ACCOMPLISHED” banners back in Allendale. 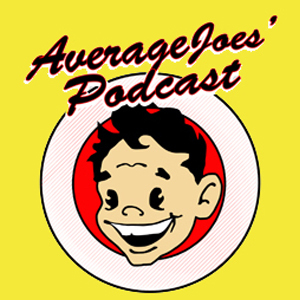 Next year’s tournament will be held in Columbus, Ohio.